Open data has attracted huge attention for the construction of smart city in terms of delivering useful city information to citizens and interacting with citizens from the city council perspective. 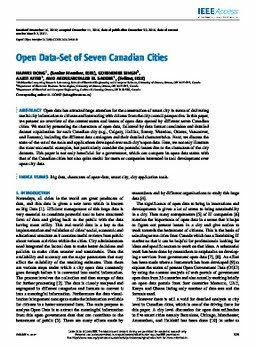 In this paper, we present an overview of the current status and issues of open data opened by different seven Canadian cities. We start by presenting the characters of open data, followed by data format conclusion and detailed dataset explaination for each Canadian city (e.g., Calgary, Halifax, Surrey, Waterloo, Ottawa, Vancouver, and Toronto), including the different data catalogues and their detailed characteristics. Next, we discuss the state-of-the-art of the tools and applications developed over each city's open data. Here, we not only illustrate the most successful examples, but particularly consider the potential issues due to the characters of the city datasets. This paper is not only beneficial for a government, which can compare its open data status with that of the Canadian cities but also quite useful for users or companies interested in tool development over open city data.